A ruffly, feminine printed sheer blouse under a silk slip dress. Girly and flirtatious, there is nothing childish or morbid (as the title may suggest) about this. Great for fancier occasions where you may not be as comfortable showing so much skin, but don't want to take away from the beauty of a little negative space. Part 2 will deal with layering over T shirts for a more casual look. P.S. if you like this silk slip dress, you can use this referral link to get 10% off your first order! Since the dress is made of silk, it doesn't do well with bulky/highly textured tops underneath. The texture shows through, and the bulk ruins the silhouette of the dress as it is unstructured. 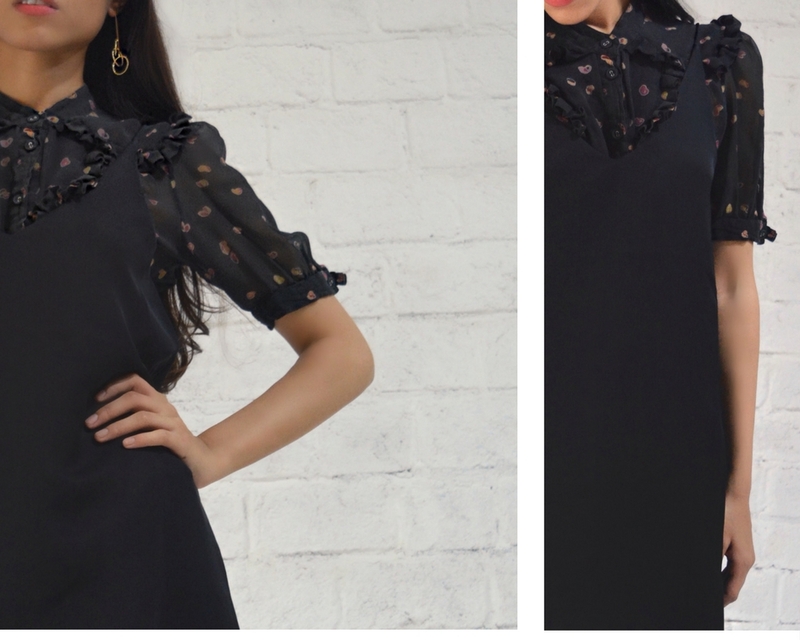 Or, you could pair the dress with a sheer lace top with 3/4 sleeves to make it a little dressier. Any cotton/silk shirt with fluted or voluminous sleeves in black/contrasting colour would give you that great 90s vibe that's so on trend right now! An off shoulder crop with a straight neckline would be a cute way to add some coverage to the décolletage while keeping the look less formal and more casual. Round neck and high neck blouses work well with the v neck also. Scoop necks and bateau necks both clash with the simplicity of the V neck on the slip dress. Along the same vein, stay away from V neck tops unless they mirror the slant of the slip dress neck to a T, otherwise the lines clash. Same for square neck tops...it may be beautifully geometric or it may look like a train wreck. Though I've styled this dress with flats, leather ankle boots in a burgundy, black, or white would look amazing for fall. Chanel esque block heels with a cap toe would be a wonderful way to dress up this styling option as well. Belting with a D ring belt, with some pvc boots, and a a turtle neck would add such a retro vibe. I don't think a belt would work the way I styled it, but it's a great way to change up the lewk of this style quickly.